The story: Camilla Cream loves lima beans, but she cares too much about what other people think to actually eat them. As she tries to pick the perfect outfit to impress all of her classmates, she suddenly grows multi-colored stripes all over her body. The doctors and specialists can't figure out how to cure her and every remedy gives her a new addition - viruses, berries, more colors, and even a tail. Could the little old lady at the front door know what to do? Mama opines: This book will make your little one laugh at the funny transformations that poor Camilla goes through. The pictures are wonderful. More than that, it will hopefully remind them that they do not have to please other people. Camilla is a big people pleaser, but she learns through this adventure that it's ok to march to your own drumbeat. If your child likes lima beans though, you may have to have them on hand for dinner after reading this book! 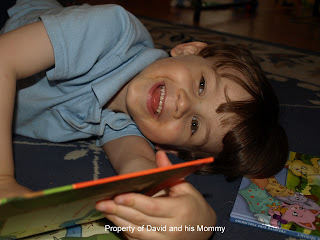 Thoughts from David: I like it because, well, A Bad Case of Stripes is my favorite book. Camilla turns all sorts of colors and looks like a beautiful rainbow! Favorite part: She turns into a medicine, into a giant pill! It's a fun one, isn't it? My sister was so kind to let David borrow some of her favorite childhood books...now that he doesn't chew on them or rip pages! Just eat the beans already!! It must have been so much fun to illustrate that book.